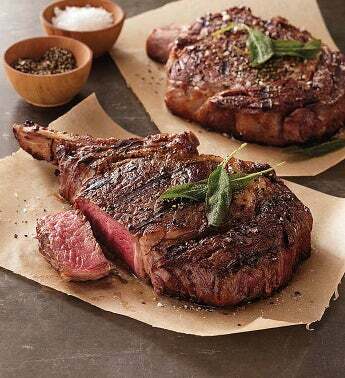 Stock Yards® "Chicago Cut" Prime Rib Chops embodies the steakhouse experience through and through. Loads of hearty flavor and juicy tenderness make this steak worth dining in. USDA Choice is the most popular grade of beef for its well-marbled texture and butter-rich flavor, giving it an exquisite tenderness and taste. Stock Yards® "Chicago Cut" Prime Rib Chops embodies the steakhouse experience through and through. Loads of hearty flavor and juicy tenderness make this perfectly marbled steak worth dining in.